We often encounter extraordinary people in life; people who open our eyes to hidden aspects of the world that we have never even perceived to exist. To meet people who possess the exceptional ability to alter our lives stories is already remarkable. However, when these significant figures in our life turn out to be children, the level of notability increases a notch. 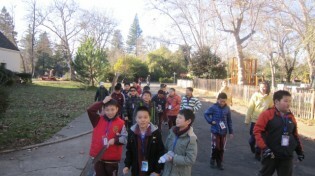 On January 16th and 17th, my class received the opportunity to teach and interact with a group of 39 fourth graders from Fu Shan Elementary School fromShanghai. 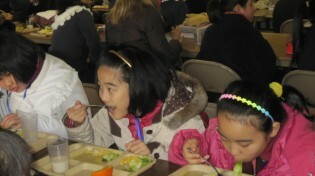 Due to the cultural exchange program thatFushanElementary School promotes, they chose to visit theInstillingGoodnessElementary School andDevelopingVirtuesHigh School for two days. Through our interaction with the visiting students for two days, I feel that the lessons that I have received from these children are priceless. It was Monday, January 16, and I had just spent the entire morning making last minute preparations to ensure perfection for the rest of the day to come. My class stood waiting outside the IITBT building, heart racing in anticipation and stomach fluttering with butterflies. Fear and doubts flooded my mind. “What if the children can’t understand my English or Chinese? What if they don’t like our presentations? What if they don’t like ME?” Suddenly I sighted my core teacher led a line of students clad in maroon uniforms walking toward us waiting at IITBT. A rush of excitement surged through me – I forgot my worries. They finally arrived! As the day progressed, we educated them about the City of 10,000 Buddhas, our school, some significant traditions, and the life story on Ven. 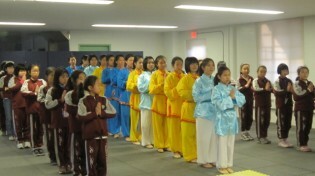 Master Hua. I was surprised at the level of discipline that these children possessed, for they not only listened intently to our presentations, but they also stood up to answer questions and ended their answers with a “thank you”. To see these children, at such a young age, understand morals and manners was inspiring. When a few of my classmates and I took the students on a tour around CTTB, I felt like I was seeing CTTB in an entirely different way. The blue sky, old buildings, plants, peacocks, white doves, even the dry leaves on the ground that I always just glanced past and ignored were special and new to these children. They questioned about different flower species, and stared in awe at all the animals they saw, even the miniscule insects crawling on the sidewalks. It made me change my perspective of the life around me, and view these features as blessings. It also caused me to realize how much of the world I was missing out just by choosing to overlook minor details and only noticing things that were of regard towards me. Selfishness always causes a big loss on our side. 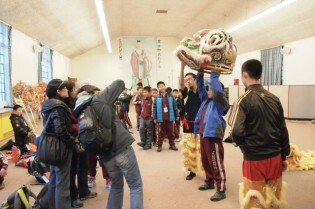 Afterwards, the boys and girls were split apart; the boys went to learn about Lion Dance from the Boy’s School students, while the girls stayed to learn about Chinese Dance. In the evening, while I walked the girls to dinner at the Dining Hall, one girl asked me, “Sister, I want to come to this school. Is it possible?” Laughing, I replied, “Of course, you could. You just have to apply when you grow older.” I never knew how to interact with children, but that day I realized that I had always been worrying too much about perfection. All I had to do was be myself because these children were still too pure to judge or criticize me. They are just like my own little sisters and brother. 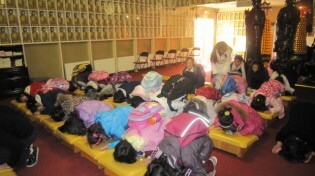 Instinctively, I sincerely wanted to care for them and make their time here blissful and memorable. 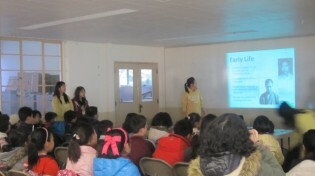 The next day, January 17th, the children attended various classes with our school’s students. 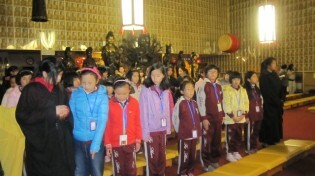 Although most of the children weren’t Buddhists, they were all very acceptant of our customs and eager to try them out. 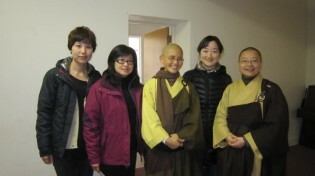 When they attended the Buddhism class held by the 10th graders, I was surprised at their interest in the subject. 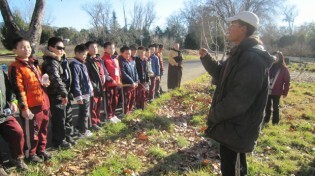 They listened attentively to specially designed lessons on the Buddha’s life, Six Great Principles, and basic human virtues of honesty and filiality. 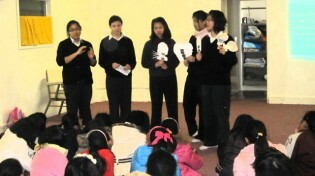 Of course, the students’ favorite singing activity was also included. 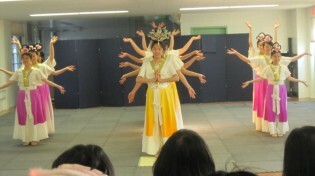 Together we ssng “the Dharma Wheel” and chanted the Six-Syllable Great Bright Mantra and Guan Yin Bodhisatta. Seeing their enthusiasm, it made me feel happy, for all our hard work and preparation was really worth it. Just interacting with the children gave me a really warm and fuzzy feeling inside. 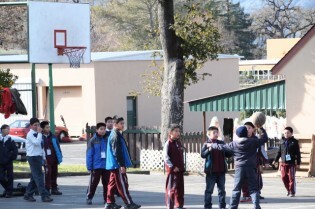 When they all pulled out small presents for Chinese New Years and gave them to students in our school, I discovered how good and happy it felt to finally do something meaningful for others. Even as we sent them off in their tour bus, I couldn’t stop jumping and waving goodbye to them. A part of me just wanted them to stay longer, so I could talk to them more and get to know each one of them better. However, the other part of me wanted them to leave and take the invaluable experiences they have had inAmericaand bring them back to their families inShanghai. I wanted them to take the knowledge and virtues we shared with them that day, and apply it in the daily lives. I wanted them to understand how blessed they were to have the opportunity to visit America and how fortunate they were to have the privileges they had so that they feel grateful and satisfied with what they have. Those two days passed like a blink of an eye. I am thankful for all the effort and hard work everyone has put in to make it happen. To all the teachers and adults who helped make these two days happen, I am extremely grateful for your enormous amount of effort, immeasurable support, and inspiration. Also, thanks to all the students fromGirlsSchoolandBoysSchoolwho have put their in time and hard work. Seeing everyone dedicating their time working collaboratively as a team to support this event, I was very touched. At the same time, we are exceptionally grateful towards the Fu Shan students who have chosen to visit our school and give us this opportunity to work together. Thank you and I will miss our amazing time together! 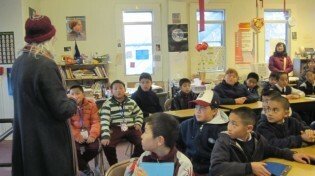 I very much enjoyed reading the story of the students’ visit. Your report captured the events and the feelings of the two days. You communicated the experience in a way that made it come alive for the reader. Also the translation was effective and fluid. I’m sure the Chinese students and their parents will enjoy reading the account. Thanks for sharing. I forgot to mention: great photos! I am one of students Mum. Reading your article I feel that I am in that event and having activities with all of you. Your story is alive in front of me. I enjoyed the whole story and the picture which described from your article. Well done. Thanks for your record which will become a good memory in the life of our kids.